Apple Park is officially nearing completion as 2017 winds down, according to a new drone video that has captured footage of the company's campus. Shared by Matthew Roberts, the video comes nearly one month after an update in late September showed off Apple Park at sunset, and almost one year after "major landscaping changes" appeared around the campus. Now, according to Roberts, Apple Park is "nearly complete," with fewer pieces of construction equipment dotting the site. 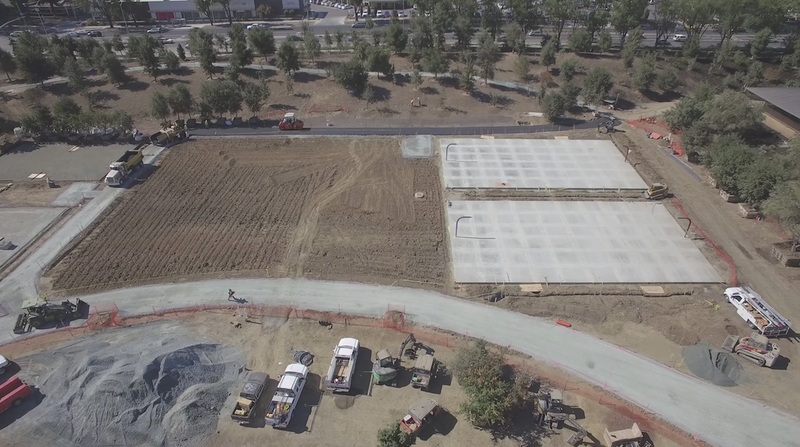 Landscaping remains a focus for the remaining work, and paths are being paved throughout the campus to connect buildings and areas of Apple Park for its employees. In terms of complete buildings, the new video showcases the finalized Visitor's Center, which members of the media got to visit during the iPhone X event in September. Roberts' drone video also shared progress made on the sporting areas at Apple Park that the company has built for workers to unwind, including an outdoor spot for basketball and tennis courts currently in the middle of construction. Elsewhere on the campus, there's also a 100,000 square foot fitness center for employees to work out in. Although Apple Park isn't yet officially finished with construction, some workers have already moved in to offices on the campus, and Apple hosted its iPhone X event at the Steve Jobs Theater last month. Once it is finally completed and all employees are moved in, Apple Park will house 12,000 workers across its 2.8 million square foot campus. Call me when they add a lazy river. You're born in the wrong era dude. You'll fit in uncivilized world or just live in a jungle somewhere. Amazing, still no snarky responses about how our Apple stuff become so expensive over the years due to this?! Come on MacRumours, we can do better than that! I wonder will the visitor centre open November 3rd to coincide with the X launch.